What do you think about Burton CUSTOM X? Stiff and fast! It doesn't let you down in higher speeds, the more you press the board the better it will be! Very fast from turn to turn if you want to, even if I prefer long carving turns. Very positive sprung in the board! Returns a lot if you press it. Good cutting and speed stability. Experienced as awkward unless you go hard and actively. If you like speed and sharply cut, this is a good thing. Drive it with Diode Binding and Driver Boots. But in honesty, I think Extrem Enlight has better cut and is even more speed-stable. Gets 4 in grades when I expected a little more. Riding style: Everything but park. Cruel stable at high speed and cruel feeling, you just know what's happening underneath you. I have not found anyone yet with it for three seasons now. Awesome stable board that works everywhere but one has to press for it to feel good. If you like the board to decide, you should not buy this piece. Without taking a rocker instead. 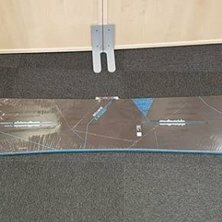 I have been boarding for almost 10 years and have tested or owned almost all models Burton has had and this is clearly the best board I've driven on works perfectly for me. That's why I have not replaced it. Stable and hard. A board that does not surprise and drop the edge grip for no reason. Hard, more of the rider is required to have fun on this board. I imagine anyway, a common custom or Flying V is probably seen by most as more easy-going. I have a custom right now a Custom X 159 Wide 2011. Prior to that, I had a Custom Flying V 162 Wide 2011. The boards are like night and day compared to each other. Flying V'n is a lightweight and fun board, which works very well on most surfaces. Followed at lower speeds in a way not Custom X is. Despite its softness, Flying V is just as stable. Custom X is the board I prefer of the two. With its 159 cm, I experience it as larger and more stable compared to the Flying V 162. I am myself a heavy rider who likes to ride fast and push properly when I cut turns. Custom X is for me like a snowboard should be. When it begins to go fast, the board's inserts do not fail, it is stable and swells unevenness in a very good way. What I'm going to miss compared to Flying V is probably that it's worse in sneezing, harder to get up my nose, and it's a bit shorter. The 2011 Custom X is the board I liked most during my 20 years + as a fighter, so far I have not disappointed myself. So far this winter I have had a few days in Chamonix, as well as the park at Kungsberget. It works clockwise for both of these purposes.